This Museo Mundial installation is about raising awareness on climate change linked to Millennium Development Goal (MDG) 7 ("Ensure environmental sustainability"). We aimed to inform visitors about the global problems of air pollution and ecological transport systems, mainly in relation to public transport. In the Orient Hall of the Museum, we demonstrate the impact of carbon dioxide emissions over recent decades, as well as the effects of micro and nano particles arising from engines that burn fossil fuels. We also want to inform visitors about land use, extreme weather and climate change and their effects on our livelihoods. The tableau contains short texts, well-designed diagrams and spectacular photos. We highlight people living at risk in coastal areas or in areas that are turning into deserts. The installation is in the form of an exhibition board hanging on the wall of the Orient Hall. On the board we demonstrate the negative effects of carbon and other fossils on the atmosphere, such as the greenhouse effect. Global climate change makes life even more difficult for people in so-called developing countries. They suffer from droughts, floods and tornadoes even though their own carbon emissions are tiny compared to those in developed countries. In the display, we show environmentally friendly solutions like greater energy-efficiency, greater use of the railway to transport commodities and the use of solar power. This is where the installation has a direct connection to the subject matter of the Railway Museum. These alternative solutions are designed to reduce or halt the adverse effects on the environment. On the topic of air pollution, an interactive element was designed especially for children. A toy placed in a wooden box contains interesting questions together with their answers, decorated with vivid colourful drawings. This exhibition board is linked to MDG 7 (“Ensure environmental sustainability’). In designing this installation we followed the sentiments of Mr Albert Schweitzer, who said that: "The future is not going to make up for what you miss in the present." We, once again, looked for a topic with some connections to railway transportation and to the MDGs. The increasing prominence of climate change and the resulting anomalies in the weather, gave us the idea of addressing the issue of global warming and air pollution. 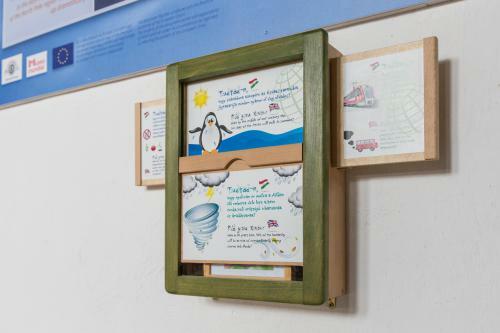 We designed an exhibition board that hangs on the wall and, as an interactive element, a wooden box in which interesting questions and answers on the subject are hidden and which is suitable for use by children. The Clean Air Action Group, one of Hungary’s top research bodies, helped us greatly by providing their previous studies. In addition, we read a number of studies on the internet and compared these with data on carbon dioxide emissions from railway transportation. The biggest difficulty we faced was selecting appropriate materials from the vast amount of information available and presenting the data on the board in a way that even children could understand. Furthermore, we had to find a graphic designer and a printing contractor to implement our ideas. The idea to create a wooden box as an interactive element in the installation came from the Hungarian Tale Museum. We contacted the fabricator of the original wooden box and asked him for a quote, and then we planned our final version. Involving the graphic designer in the process, we planned the exhibition board for the installation. After finalizing the graphic design, we sent it to a printing house. They then made our exhibition board and delivered it to the Railway Museum. Thanks to the graphics and the careful collection of data, adults and children can get a clear picture of the reasons behind extreme weather conditions and of the consequences of global climate change. The wooden box as the interactive element is intended mainly for children, which is our way of making them more receptive to the subject. The endless resources available on this topic meant there was a vast amount of data to wade through, which made it challenging and time-consuming to select relevant information. It was difficult to sort through and select relevant information from our research in a systematic way. Unfortunately, space on the board was limited; we could even have filled three boards for this topic.